Update: Because of a prediction of steady rain, the Powwow will be held on the second floor of the Cuyamaca College Student Center. 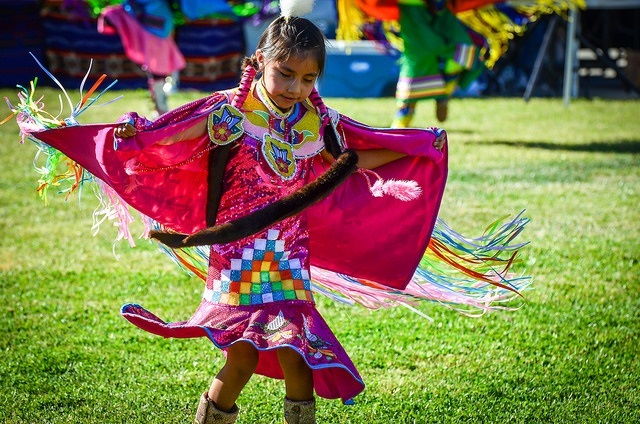 Native American tribes from throughout the West will be well represented at Cuyamaca College’s 5th Annual Powwow on Feb. 2 – a free, public event celebrating American Indian culture complete with bird singing, gourd dancing, storytelling, and more. More than 2,000 people are expected to attend the powwow, which is scheduled to commence with singers at 10 a.m., followed by gourd dancing at 11 a.m. and the grand entry of inter-tribal dances at noon. The powwow takes place at the Cuyamaca College Student Center and continues until 8 p.m.
A variety of traditional Native-American food will be on menu, including fry bread and Indian tacos, and an abundance of Native-American arts and crafts will be on sale. Serving as powwow master of ceremonies is Randy Edmonds, who hails from the Kiowa and Caddo nations of Oklahoma and who has served as a powwow emcee for more than a half century. Victor Chavez is the arena director, Robert RedBear Solis is the head man, and Katianna Warren is the head woman. The Asha Takuk Bird Singers will share the traditional song of the Kumeyaay, and the Calpulli Mexihca Aztec Dancers will perform during a dinner break. The powwow is sponsored by Cuyamaca College’s Native American Student Alliance, the Division of Equity & Engagement, Student Affairs and Associated Student Government. The word powwow is the Anglicized version of the Algonquian term pau-wau, or pauau – which means “he dreams” – and referred to a religious gathering of medicine men and spiritual leaders. The modern-day powwow is rooted in a Pawnee religious ceremony dating to the early 19th century. Southern California powwow tradition includes bird singing, which tells the history of the Native American people. Cuyamaca College has a long history of supporting Native-American students and Native-American studies. Its name comes from the Kumeyaay phrase “Ekwiiyemak” – which means “behind the clouds,” “above the rains,” and “the place where the rains come from the heavens” – and the campus is located on traditional Kumeyaay territory. Cuyamaca College became among the first community colleges in California to offer a degree program focusing on the language, culture, and history of a specific Native-American tribe when it unveiled its associate degree program in Kumeyaay Studies in 2015. In addition, Cuyamaca College at the powwow will unveil the Richard DeCrane Native Community Leaders Scholarship. DeCrane spent the early years of his life on the Crow Reservation in Montana before moving as a young boy to the Navajo Nation, where he was raised by his maternal grandparents. A Navy veteran, DeCrane has long been involved in the Cuyamaca College Native American community. The Richard DeCrane Native Community Leaders Scholarship will be awarded each spring and fall. The $500 scholarship is open to all majors, but recipients must be a member of the Native American Student Alliance at Cuyamaca College.